The Sunday bird walk went to the Little Qualicum River Estuary in Qualicum Beach. The morning was cloudy and cool. Light rain finished off the morning walk. The highlights included seeing at least four hundred Black Scoters not far from shore. We watched in awe as forty Black Turnstones fed along the incoming tide not five feet from us. Pacific Loons, Common Loons and Long-tailed Ducks were seen further offshore. Canada Goose, Trumpeter Swan, Eurasian Wigeon, American Wigeon, Mallard, Northern Pintail, Green-winged Teal, Greater Scaup, Harlequin Duck, Surf Scoter, White-winged Scoter, Black Scoter , Long-tailed Duck, Bufflehead, Common Goldeneye, Barrow's Goldeneye, Common Merganser, Red-breasted Merganser , Pacific Loon, Common Loon, Horned Grebe, Double-crested Cormorant, Great Blue Heron, Bald Eagle, Killdeer, Black Oystercatcher, Black Turnstone, Dunlin, Mew Gull, California Gull, Thayer's Gull, Glaucous-winged Gull, Belted Kingfisher, Northern Flicker, Steller’s Jay, Northwestern Crow, Common Raven, American Robin, European Starling, Chestnut-backed Chickadee, Spotted Towhee, Song Sparrow, House Finch and Red-winged Blackbird. An American Kestrel was spotted perched on a hydro line overlooking the Ugly Dwarf Meadows near the ESSO gas station at Nanoose Bay. 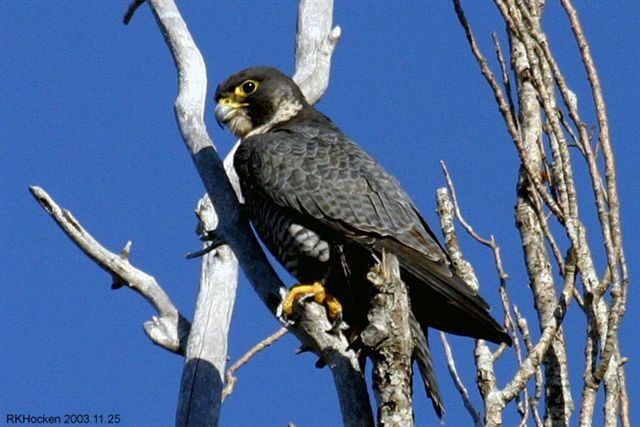 A Peregrine Falcon was seen just off Highway 4 between Highway 19 and Qualicum Beach. A Rock Sandpiper was spotted on the rocks off Dallas Road in Victoria. Sixteen Evening Grosbeaks and a flock of Bushtits are visiting backyard feeders along Lantzwood Drive in lower Lantzville. 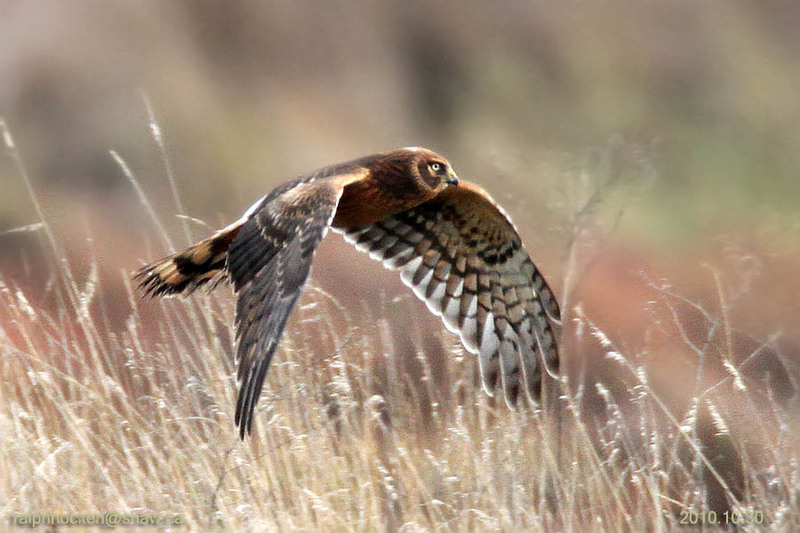 Two short-eared Owls and a pair of Northern Harriers were spotted at the Nanaimo River Estuary in south Nanaimo. Pelagic Cormorant, Common Loon, Horned Grebe, Bufflehead, Common Goldeneye, Dunlin, Black-bellied Plover, White-crowned Sparrow, House Finch and Purple Finch were seen at Deep Bay. An Eurasian Collared Dove, a Song Sparrow, two Spotted Towhees, a Fox Sparrow, a pair of House Finch, a Varied Thrush, twelve to twenty Dark-eyed Juncos, thirty to forty Brewer's Blackbirds, Red-winged Blackbirds and European Starlings are all visiting feeders along Meridian Way in Parksville. The Tuesday bird walk went to French Creek. The morning was mostly clear with a very strong wind. The surf was up and pounding at Columbia Beach making it too windy for birding so we ventured into the woods along French Creek. 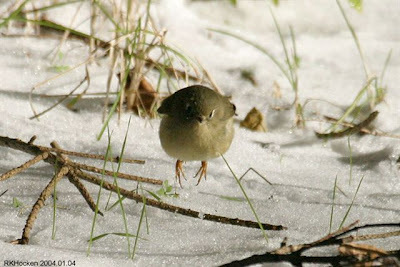 Among the highlights was the sighting of our first Orange-crowned Warbler of the year. A mixed flock of Golden-crowned Kinglets, Ruby-crowned Kinglets, Chestnut-backed Chickadee and Red-breasted Nuthatches were feeding high up on the Alder Trees in the forest along French Creek. Purple Finch, House Finch, Song Sparrows and Fox Sparrows were feeding on low bushes. 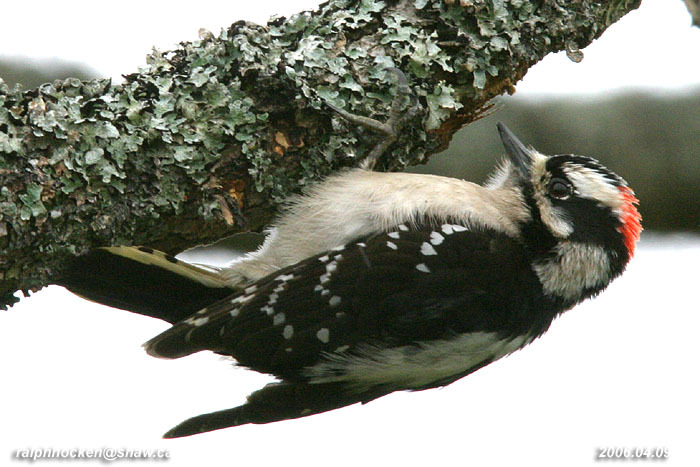 We had great close views of a Downy Woodpecker feeding on an alder tree close to the trail. A Greater Yellowlegs flew past us to finish off the walk. Pine Siskin and House Sparrow. Two pairs of Evening Grosbeaks are visiting feeders at the Living Forest Campground in south Nanaimo. An adult Sharp-Shinned Hawk was spotted sitting in a tree on the edge of a field in Cedar By The Sea. A Golden Eagle was seen in a front yard along Ocean Trail in Bowser. Four Barn Swallows were seen at Buttertubs Marsh in Nanaimo. A Golden Eagle was seen at the edge of a previously logged and not heavily-wooded area along Cochrane Road, about three km from the Old Island Highway, near Qualicum Bay. The eagle was at the side of the road and flew into a tree close by. The bird was viewed from a car at close range. Monday February 28, 7.30 pm at Springwood School in Parksville. Guest Speaker will be Lisa Spaven, coordinator of B.C. Marine Mammal Response Network. She will share her knowledge of the behavioural and environmental aspects of marine mammals such as seals, sea lions and whales. 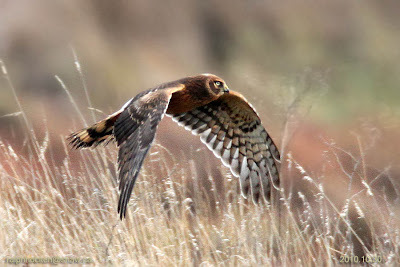 The Tuesday Bird Walk on February 29, 2011 will be going to the Englishman River Estuary, Shelly Road side. We will meet at the Parksville Beach Community Park at the parking area in front of the Lions Playground at 9 A.M. or at the end of Shelly Road on the ocean side of highway 19A at about 9:10A.M. The Sunday Bird Walk, March 06, 2011 will be going to Buttertubs Marsh. We will meet at the Backyard Store at 9:00A.M. or at the parking area off Bowen Road at about 9: 20 A.M. The Sunday bird walk went to Neck Point in Nanaimo . The morning was sunny but there was a stiff wind off the water. The highlights included seeing a Hutton’s Vireo feeding on an Alder tree. A Double-crested Cormorant and two Pelagic Cormorants were resting on a close gravel bar giving us great looks at the coloring of both species. We saw several small flocks of Ruby-crowned Kinglets gleaning insects from the Alder Trees-- one gave us views of his ruby crown. We heard a flock of Pine Siskins from high up in the Alder Trees. Trumpeter Swans, Canada Goose, Bufflehead, Harlequin Duck, Horned Grebe, Common Goldeneye, Pacific Loon, Common Loon, Double-crested Cormorant, Pelagic Cormorant, Surf Scoter, Common Merganser, Red-breasted Merganser, Black Oystercatcher, Pigeon Guillemot, Bald Eagle, Thayer's Gull, California Gull, Glaucous-winged Gull, Northern Flicker, Pileated Woodpecker, Anna's Hummingbird, Northwestern Crow, Common Raven, European Starling, Chestnut-backed Chickadee, Pacific Wren, Bewick's Wren, Brown Creeper, Red-breasted Nuthatch, Ruby-crowned Kinglet, Hutton's Vireo, American Robin, Varied Thrush, Spotted Towhee, House Finch, Dark-eyed Junco, Song Sparrow, Fox Sparrow, and Pine Siskins. A Turkey Vulture was spotted over Beban Park in Nanaimo. Two Turkey Vultures were seen soaring above the Chase River Osprey nest near Colliery Dam in Nanaimo. Over forty Evening Grosbeaks are visiting feeders along Forest Crescent in Nanaimo. Six Evening Grosbeaks and fifty Brewers Blackbirds are visiting feeders in the Columbia Beach area. 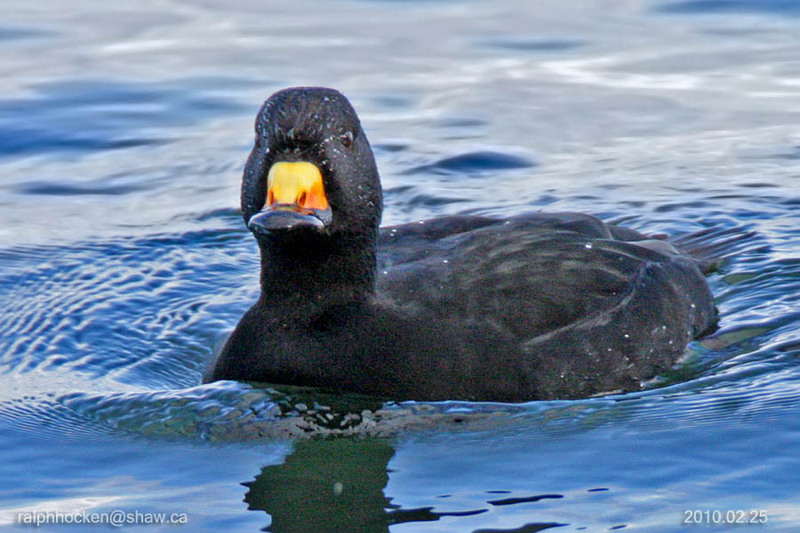 A Common Loon and two Red-throated Loons were seen at Biggs Park in south Nanaimo. Three Greater White-fronted Geese were seen at Holden Creek in south Nanaimo. Thayer's Gulls and several Glaucous-winged Gulls were roosting on a gravel bar near the shore. Several flocks with six to nine Common Murre flew down the Strait of Georgia throughout the morning. We spotted a Pigeon Guillemot, a Marbled Murrelet and a Cassin's Auklet bouncing on the waves further off shore. American Robin, European Starling, Spotted Towhee, Song Sparrow and Dark-eyed Junco. main parking area off Admiral Tryon Boulavard at about 9:20A.M. 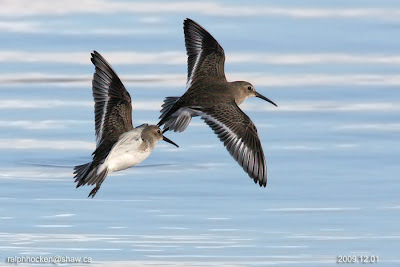 The Sunday Bird Walk, February 27, 2011 will be going the Little Qualicum River Estuary in Qualicum Beach. We will meet at the Backyard Store at 9:00A.M. or at the viewing platform along highway 19a near Garrett Road at about 9: 30 A.M. The Tuesday bird walk went to Rathtrevor Provincial Park in Parksville. The morning was cloudy with a stiff wind off the Strait of Georgia. The highlights included seeing thirty-eight Brant Geese fly in and land just off shore. A large flock of Dunlin, Black-bellied Plover and Black Turnstone were seen right on the tide line. A large flock of Mew Gulls, California Gulls, Thayer's Gulls and several Glaucous-winged Gulls were roosting on a gravel bar near the shore. Several flocks with six to nine Common Murre flew down the Strait of Georgia throughout the morning. We spotted a Pigeon Guillemot, a Marbled Murrelet and a Cassin's Auklet bouncing on the waves further off shore. The Tuesday bird walks went to the following sites during 2010--Beaver Ponds at Nanoose Bay, Rathtrevor Provincial Park, Plummer Road side and the Shelly Road side of the Englishman River Estuary, Top Bridge Trail, Parksville Bay, French Creek, Columbia Beach,Lot Ten, Little Qualicum River Estuary, Nile Creek and Deep Bay. "Rare Bird Alert- Northern Mockingbird"
A Grey Catbird is still visiting a backyard suet feeder in North Nanaimo. Spotted Towhee, Red-winged Blackbird and House Finch. Over forty Evening Grosbeaks were seen in the Cinnabar Valley in south Nanaimo. An American Kestral was seen in a field near the Crow and Gate Pub in Cedar. Fifteen birders saw thirty species of birds. Common Raven, Golden-crowned Kinglet, Song Sparrow and Golden-crowned Sparrow. Warbler were seen in the 5300 block of Hammond Bay Road in Nanaimo. The Sunday Bird Walk, February 20, 2011 will be going to Neck Point in Nanaimo. Point off Hammond Bay Road at about 9: 20 A.M.
Barrow's Goldeneye: Ralph Hocken Photo. 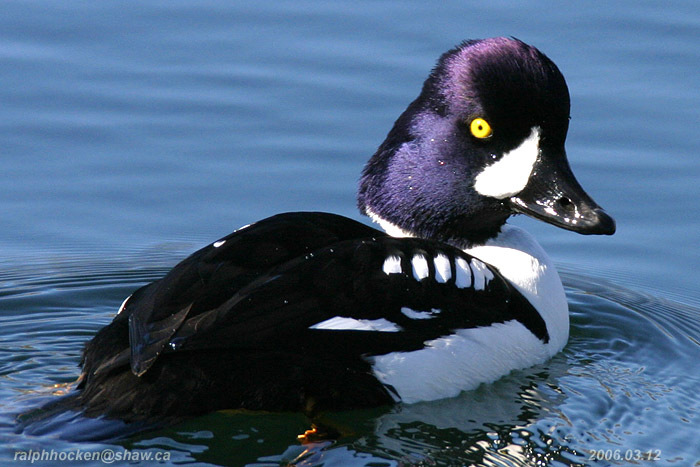 Barrow's Goldeneye were spotted further out on the Bay. Five Black Oystercatchers flew in and started feeding along the tideline. morning was foggy with misty rain and a cool breeze off the Strait of Georgia. Junco, Golden-crowned Sparrow, White-crowned Sparrow and Brewers Blackbird.. The Grey Catbird is still visiting a backyard suet feeder in North Nanaimo. A large flock of Red-winged Blackbirds were spotted in Cedar. are visiting feeders in the 2300 block of Hemer Road in Cedar. A Red-throated Loon was spotted along French Creek. Gulls on the roof of the Rupert Square Mall in downtown Prince Rupert. The Tuesday bird walk went to the Englishman River Estuary, Plummer road side. Brewer's Blackbird, Purple Finch, House Finch and Pine Siskin. and Female Anna Hummingbirds are also visiting the backyard. 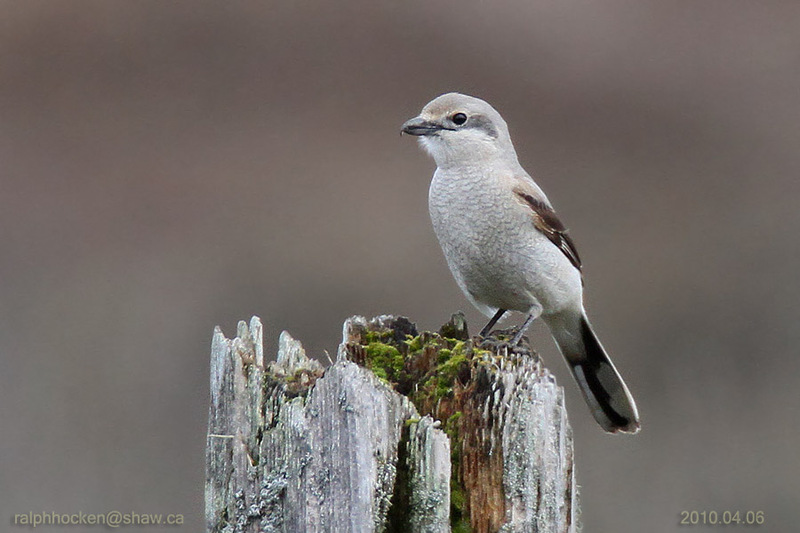 and a Northern Shrike were seen at Cathers Lake in Nanaimo. Evening Grosbeaks are visiting feeders along Homestead Way in Ladysmith. Thursday, February 10th, 7 pm in the Library on Northwest Bay Road. 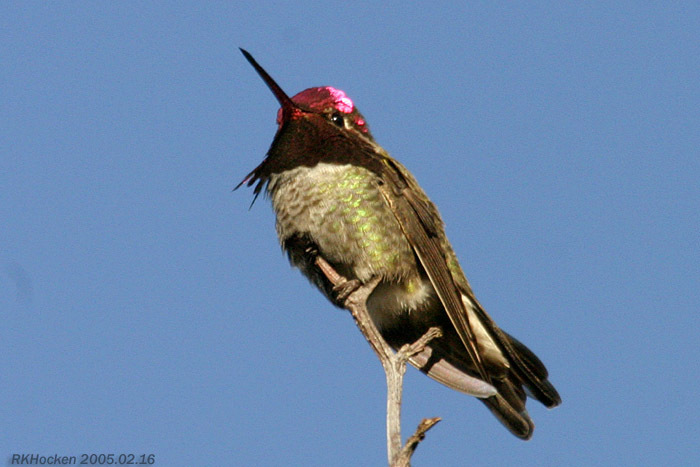 Bay Road at about 9: 20 A.M.
Anna's Hummingbird, Ralph Hocken Photo. The Tuesday bird walk went to the Englishman River Estuary, Plummer road side. The morning was sunny but quite cool with a stiff breeze off the Strait of Georgia. The highlights included seeing three Anna's Hummingbirds perched on a bush along the trail at the first of the walk. We saw twelve Gadwall feeding just off the mudflats and a large raft of Pacific Loons on the Strait of Georgia.